Start the Holidays off Right with City of Lights! 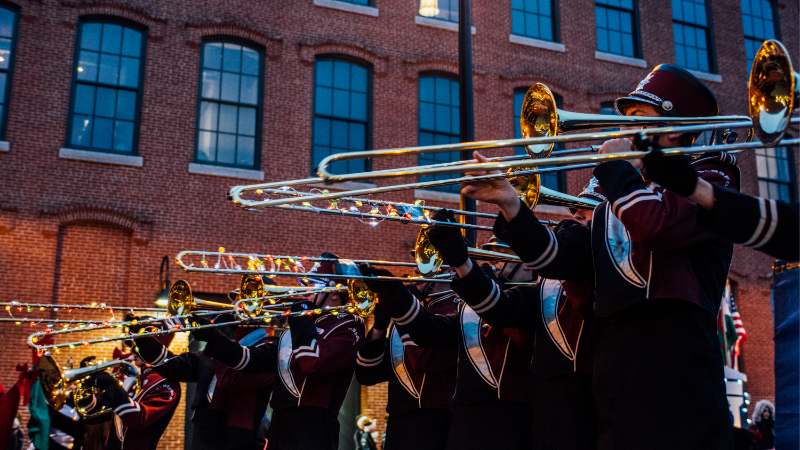 The holidays are just around the corner, and there is no better way to kick off the holiday season than by spending the day enjoying Lowell’s City of Lights Parade and Celebration! With a whole afternoon of planned activities and several nighttime happenings to keep the celebration going, City of Lights offers a full day of entertainment for everyone! November 24th marks Lowell’s 30th annual City of Lights celebration, and this year’s festivities are going to be better than ever! There will be plenty of fun holiday traditions to enjoy like having your photo taken with Santa and Mrs. Clause at City Hall from 1 – 3 PM, watching the classic Christmas movie Elf at the Lowell National Park Visitor Center at 2 PM, and singing along to your favorite holiday songs at JFK Plaza from 3:30 – 5:30 PM. There will also be ice skating at JFK Plaza from 1 – 5 PM with skates available to rent for $1. The Lowell National Historical Park Holly Jolly Trolley rides will run from 12 - 3:30 and there will be self-guided tours of St Anne’s Church from 2 - 6 PM. Silly Sally will provide children entertainment including facepainting and balloon twisting from 1 - 5 PM, a puppet show at 2 PM and a magic show at 3 PM. It’s never too early to start your holiday shopping, and City of Lights offers some great opportunities for buying gifts for friends and family—or for treating yourself! Children's Shopping Day at the Pollard Library is an opportunity for children to purchase gifts for their friends and family. From 10 AM – 4 PM the library will serve as a temporary shop where children can choose from hundreds of donated items that are being sold for $1 to $5, and have their presents wrapped and labeled for them by volunteers. From 12-7 PM, explore the holiday craft market on JFK Plaza and find locally made arts and crafts, holiday foods and more. The Brush Art Gallery and Studios is offering a chance to win a wreath from a display of about 40 beautifully decorated wreaths. The wreaths will be displayed in Edson Hall behind St. Anne’s Church on Merrimack Street from 2 – 5 PM, and the winning raffle tickets will be drawn shortly after. Local food trucks will offer their culinary specialties at JFK plaza from 1 – 6 PM, so you can easily grab a delicious bite to eat between festivities without having to travel far. However if you are feeling up to a scenic stroll through downtown, be sure to visit the several cafés and restaurants who are participating in the popular City of Lights hot chocolate competition! From 2 – 4 PM, try free samples from each location listed on the City of Lights guide and vote for your favorite cup. Also, keep an eye out for storefronts that have been adorned for the City of Lights window decorating contest and cast your vote for the store you think looks the best! The festive daytime fun leads right into the exciting main events: the City of Lights Parade and the lighting of City Hall and the Wannalancit Mills smokestack Christmas tree. Thousands of spectators line downtown streets each year in anticipation of the high-energy parade of talented marching bands, elegant holiday-themed floats, and other performance groups and local personalities. The parade will begin at 4:30 PM from Jackson Street to JFK Plaza. Following the parade, City Hall will be lit up to officially start the holiday season!